You can easily select and transfer multiple regions of audio from a track in Nuendo/Cubase to Revoice Pro in a single transfer. However, after the transfer, when the audio is displayed in Revoice Pro, only the last of the transferred regions will be the selected audio. This means that if the user creates a New Process in Revoice Pro by pressing the New Process command that automatically uses "Selected audio" to set the process length, the range of the process will not automatically be set for the length of all the new transferred regions. In this case, to process all the transferred regions, you can easily set a Playback Range in Revoice Pro to include all the newly transferred audio (or a sub-range) just before pressing the New Process command. If this is done, then all the regions within the Playback Range will be included in the process. In the image below, the Guide is continuous and the dub is in three sections. 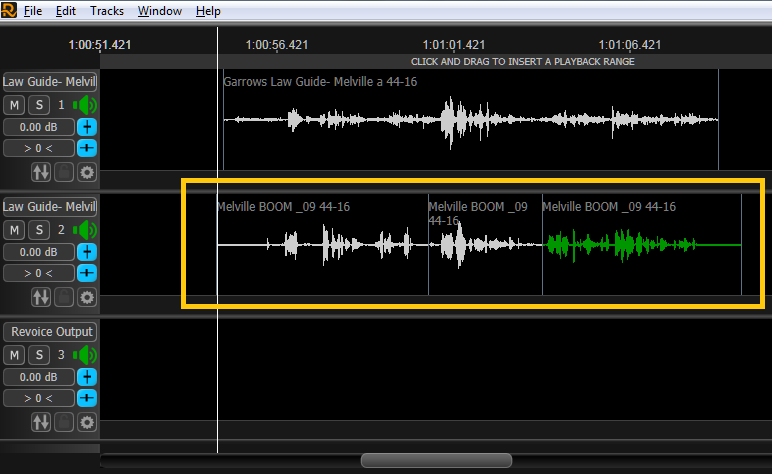 After transferring the Guide and Dub audio, only the last region of the Dub (in green) will be selected in Revoice Pro. In this case use the Revoice Pro Playback Range function to define a time period to be processed that includes all of the transferred regions.